STA ? BLAST- up to SO times less dust than OSHA standards permit! 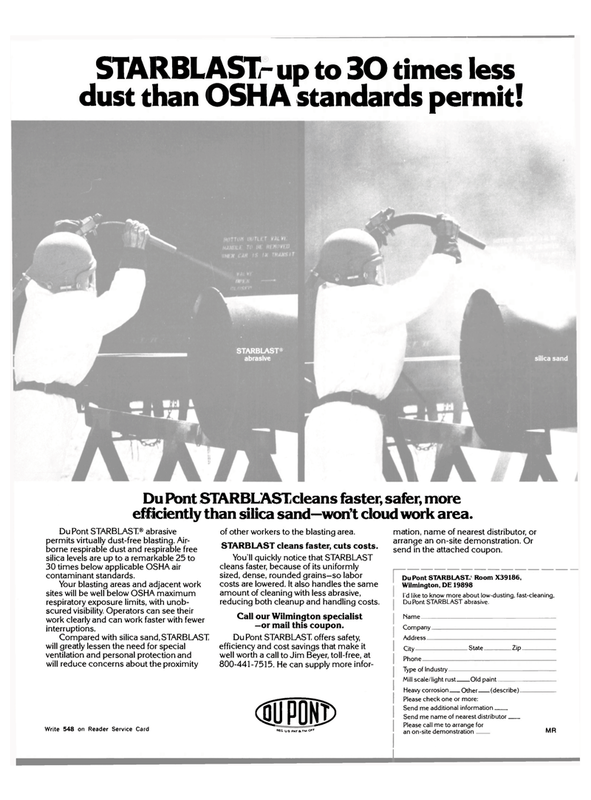 Du Font STARBLASTcleans faster, safer, more efficiently than silica sand—won't cloud work area. DuPont STARBLAST® abrasive permits virtually dust-free blasting. Air- borne respirable dust and respirable free silica levels are up to a remarkable 25 to 30 times below applicable OSHA air contaminant standards. You'll quickly notice that STARBLAST cleans faster, because of its uniformly sized, dense, rounded grains—so labor costs are lowered. It also handles the same amount of cleaning with less abrasive, reducing both cleanup and handling costs. Call our Wilmington specialist —or mail this coupon. DuPont STARBLAST offers safety, efficiency and cost savings that make it well worth a call to Jim Beyer, toll-free, at 800-441-7515. He can supply more infor- mation, name of nearest distributor, or arrange an on-site demonstration. Or send in the attached coupon.